The Speedo Aquabeat LZR Racer waterproof MP3 player attaches to the strap of your swimming goggles. This small trendy waterproof MP3 player allows you to listen to up to 9 hours of music when swimming and can hold up to 1000 songs. Available in sleek grey, black and red design it can be used to depth of 3 meters in water. 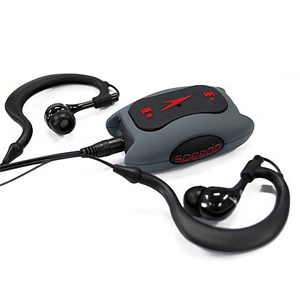 The Speedo Aquabeat LZR Racer is supplied with waterproof headphones. Playlist editing software to add and sort your music quickly, a USB & extension cable, a range of different size ear buds and a carrying case. It is lightweight and can float enabling quick and easy recovery in the pool and is simple to use with both swimwear and swimming goggles. It has large ergonomic buttons which makes it very easy to use whilst swimming. Designed to perform with the world record beating LZR swimsuit from speedo. Includes a one year manufacturer's warranty.